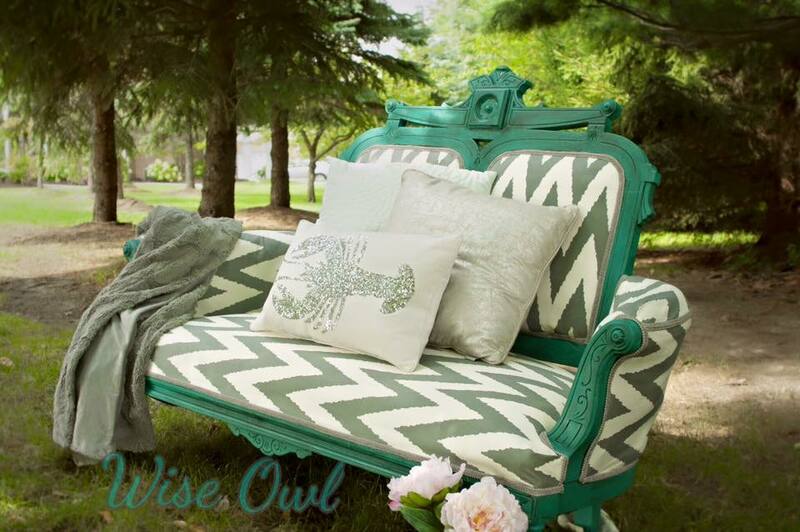 Wise Owl is looking for qualified vendors and retailers to carry our ever growing line of Chalk Synthesis Paint and our full line of finishing products. Become part of our expanding team with Michigan roots. We have eliminated harmful chemicals and unnecessary additives from our mineral paint and finishes while providing a superior product. Wise Owl was created from a love of re-purposing and reusing and we want our finishes to reflect the values that our company was founded on. Our environmental focus even extends to our website hosted on a green server that purchases wind energy credits to offset energy usage. Yes our server is powered using wind energy! It is poetic that after the economic changes that we have witnessed and experienced, we find ourselves turning to re-purposing. To make something that may have been discarded into something of beauty, is rewarding and reminds us to be resourceful. We are proud to inspire your projects and we will continue to offer new and useful products along with a color selection to fit everyone. While continuing to expand our product line and customer base we have been able to maintain exceptional products. In addition, we are keeping consumers and vendors costs low in contrast to the rising price tags paint companies are imposing on their consumers. Our Minimum startup investment for retailers remains affordable to support small businesses. We offer protected territories and no minimum monthly quotas. 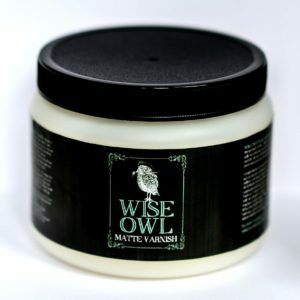 We also have affordable and speedy shipping, and a one stop product line featuring solvent free natural waxes, hemp-seed oil, glazes, VOC free paint, Matte and Satin Varnishes, Cling On paint brushes and more. We provide all marketing material including posters, brochures, and all how-to resources for you and your customers. You do not need to own a brick and mortar store in order to qualify. 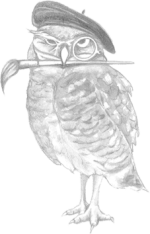 Many Wise Owl Distributors sell online, teach classes from home, or rent spaces in stores and attend vendor events and shows. Vendors will receive unparalleled support from a team that is very connected, shares projects, customer ideas, feedback and shares tips and tricks of the trade. Enjoy a protected area, no minimum monthly purchase amounts, and small opening order minimums to qualify for wholesale. Contact us for more information about carrying an exceptional line of versatile VOC free paint, all natural and solvent free waxes, all natural hemp oil, Cling Ons, glazes, and amazing paint and wax brushes. Both individual distributors and vendors with storefronts are considered. We will continue to evolve, join the fun! I have received many requests for advice on which colors to select so I put together this post featuring all of our colors. Included is some suggestions for pairings and finishes. Each color includes a description of the shades to help you make the best choice on colors and finishes. I hope you find this visual color selection guide helpful. Bright white that is white, extra white, with a side of white! If white is not a color but a lifestyle for you, this is your shade! Use clear wax to preserve the stark white quality to this clean crisp white. The perfect off-white, not too stark, not too creamy. This shade has just enough warmth to feel inviting while still remaining bright. 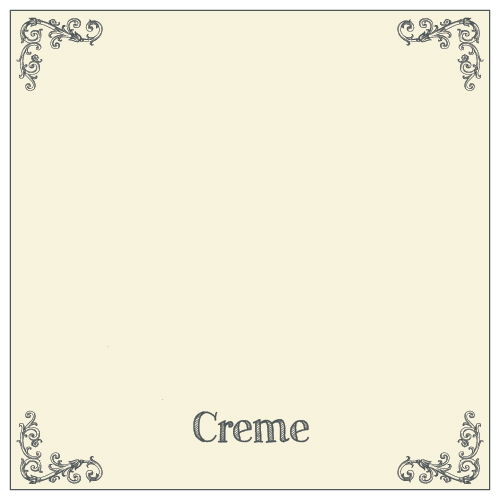 The quintessential French crème, a succulent heavy cream shade with warmth that is not perceived as yellow but a rich shabby white. A whisper of Gray that is on the white spectrum with a hint of cool gray. Vintage Duck Egg is my personal favorite to pair with Limestone. Driftwood wax is a beautiful finish that adds subtle dimension to this shade. Perfectly balanced true gray. Just enough cool and warmth to be situated in the middle of the gray spectrum. Accent with peppercorn for a 2 toned beauty but also coordinates with any shade because of its versatility. Try Black Hemp oil wax paired with it for added dimension. True and deep, this jet black is perfectly complimented by pearl wax for a luminous washed black, or white wax for a dramatic vintage chalkboard feel. Black or clear wax can also be used to preserved this pigment drenched black. The most versatile of all shades, a greige with equal parts gray and beige to create a tone that lends itself to cool and warm accents equally. Use umber wax to warm up this color or black wax to create a vintage patina. The more dramatic counterpart to Gray Linen, a richer shade of greige that is reminiscent of homemade hot cocoa with enough gray to reserve its place as a versatile neutral. Glazed in Black walnut glaze or waxed in black hemp oil wax, this neutral will reveal unexpected richness. Cocoa meets milk chocolate in a luxurious medium brown. 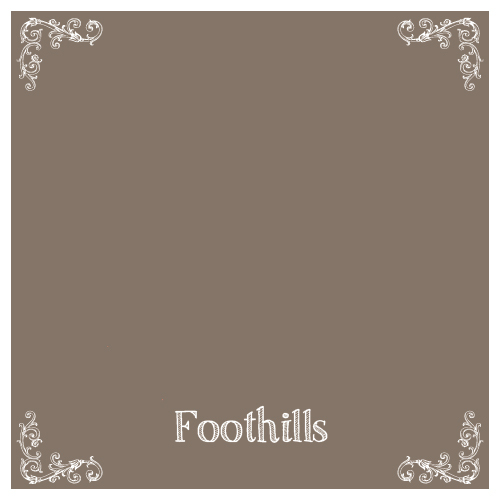 Shades of taupe make this warm neutral a gorgeous compliment to most colors. Dark Chocolate warmth with a walnut tone envelops this rich brown. A rich bronze that is a wonderful combo of cool dramatic gray and dark chocolate brown. 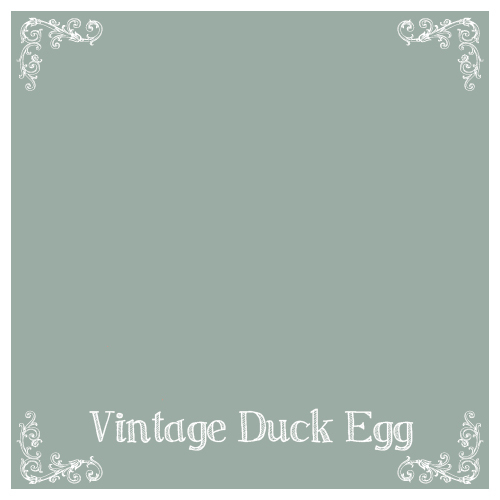 A unique shade that is beautiful paired with Vintage Duck Egg, Gray Linen, and more. Beachy salty air inspired this shade of lovely. Gray, Blue, Green, and White all combine to produce a color that seems to change throughout the day depending on the suns influence. 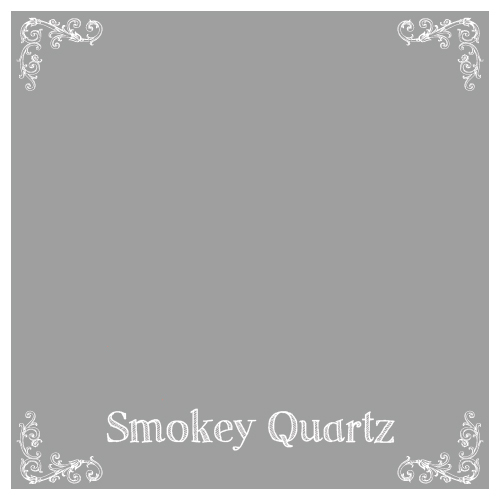 Pair with Smokey Quartz, Peppercorn, Limestone, Gray Linen, or Snow owl. 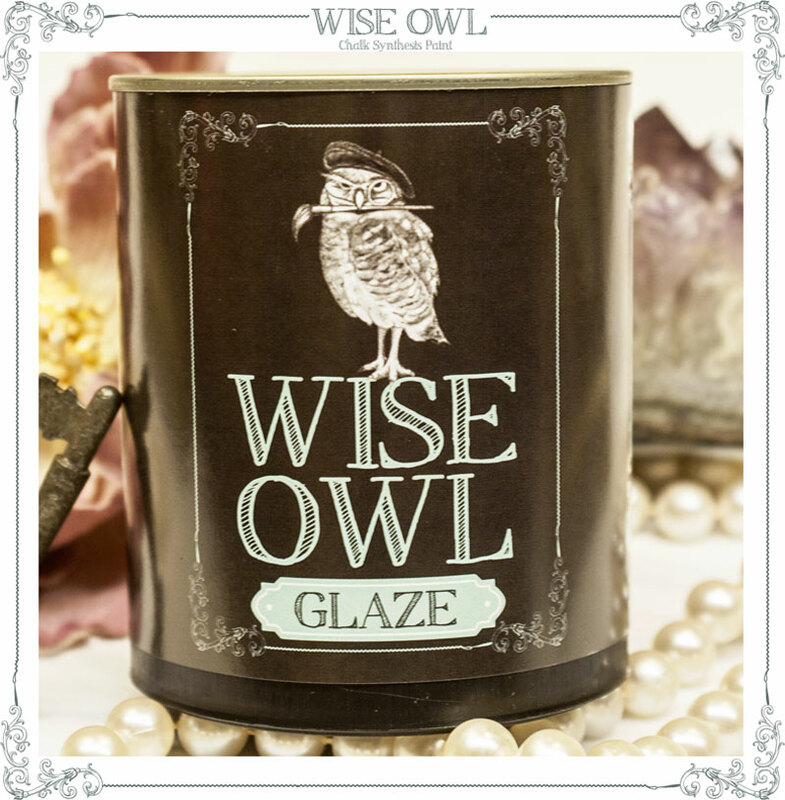 Pearl wax or Pearl glaze can be used to add luminescence without being over the top. A pale blue with brightness like a Robin’s Egg in spring. Complimented by whites, Begonia, Coral Reef, Limestone, and Gray Linen. Driftwood wax is a finish that adds a subtle dimension. One of the most loved and best-selling colors in the Wise Owl Palette. A truly versatile blue that has a slight turquoise cast while remaining an approachable and very complimentary color to most every shade. Pairs with all neutrals and Driftwood Glaze has quickly become a favorite finish. It’s safe to say that Higgins Lake plays nicely with all colors. Inspired by Its namesake, a clear and almost Caribbean looking lake in Michigan. The Perfect turquoise! Just enough green to showcase shades of blue with a slight gray cast to make this an accessible pop of color without being over the top. Black Walnut Glaze and Joyful were meant for each other where vintage patina is desired. It’s no secret that this is my personal favorite and it remains our best-selling color next to Vintage Duck Egg. It is a versatile color that can be paired with every one of our finishes beautifully. Paint is therapy and this gorgeous turquoise is your happy place! Bright, fun, electric, and versatile. 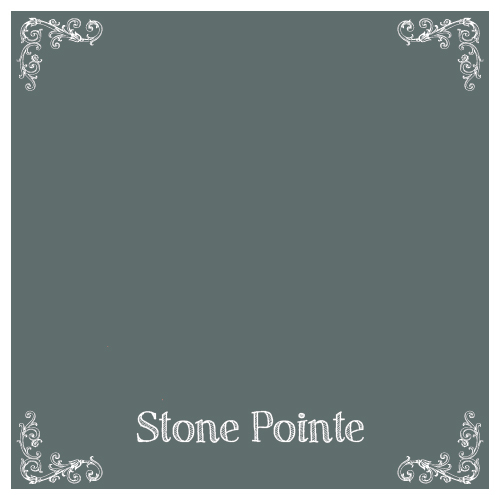 Tone down with black walnut glaze for a vintage patina or use white wash glaze to soften this shade. Umber wax can be used to create a union of opposites attract. Peppercorn and Coral Reef are two personal favorites to pair with Mermaid Kiss. This is a bright, energetic pop of color this is simple stunning paired with so many colors. Try it with antique Red for a surprising harmony. 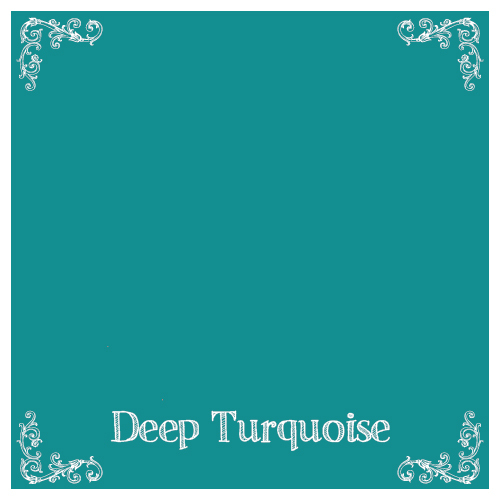 A medium-dark rich turquoise that is a welcome shade of drama and fun. Pair with Peppercorn, Smokey Quartz, Whites, Coral Reef, Neptune, and more. Black or Black Walnut Glaze are finishes that create depth when used with this color. The Shades of Blue Moon Wax pairs metallic turquoise wax and opalescent pearl wax in 1 product, creating a finish with unique subtle sparkle and white washed dimension. A tranquil green with plenty of blue and a touch of gray. A soothing shade of turquoise that is on the greener side of the color scale. Gray linen, Grecian Clay, Peppercorn and Foothills are some of the neutrals that compliment this color. Black glaze and Umber Hemp Oil wax are great to create a vintage patina and create dimension. 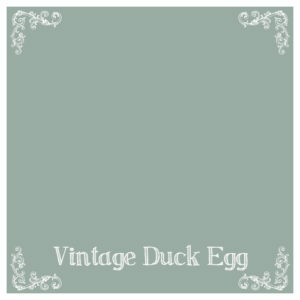 A medium vintage natural shabby chic green that is simply lovely. A muted green compared to our brighter 1950’s green. Black Walnut or Black Glaze is a beautiful compliment but Tourmaline remains a receptive color to all of our finishing products. Crème and Tourmaline pair together to create nostalgia and paired with petal you may be reminded of spring peonies. A fun and flirty garden green. This color can remain more modern if finished with clear wax or it can be the perfect shabby chic green finished with Black Walnut Glaze or Black Hemp Oil Wax. Pair with petal for whimsical charm or Coral Reef for tropical and bright attention grabbing color. Limestone is also a wonderful compliment to this green inspired by a gardens new spring growth. A blue unlike any other. This color features deep shades of denim and of emerald green creating a finish that draws the eyes in no matter where it is in the room. A lighter and beautiful compliment to Bowie, another show stopping blue. Black Hemp Oil wax, Umber wax, Black glaze, and White Wash Glaze are a few favorite finishes on this blue that is complimentary to grays and browns alike. Creature of the deep sea, an emerald green dark dramatic turquoise. Drenched with emerald and turquoise pigments, complimented by all shades of turquoise but also stands alone as a unique color selection. Pairs with many color palettes. A brave selection that reaps the benefits of adoration. Black Hemp Oil wax, White Wax, and Silver Wax all create unique dimension when used with this shade of abyss. Dusty blue inspired by an overcast day. A touch of brightness from cornflower blue and gray to tone down this perfectly shabby pale blue. Black Hemp Oil Wax and Driftwood Glaze are beautiful finishes paired with this color. Limited edition Spring 2016. Inspired by nature, this stone blue gray creates harmony with Limestone, Nebula, Smokey Quartz, or Peppercorn. Black Hemp Oil Wax and White Wash Glaze are just a couple of finishes that create dimension with this natural shade. Deep and dramatic jewel tone purple. If purple had a navy, her name would be amethyst. Grown up beauty revealed in an updated childhood favorite color. Driftwood and silver wax are unexpected finishes that produce a unique elegance to this shade of richness. 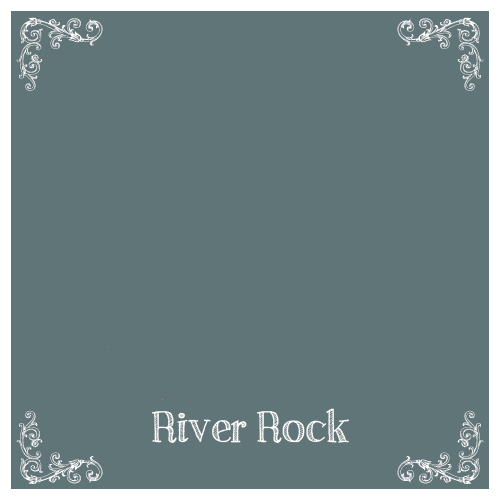 Nautical Navy Blue that belongs next to Snow Owl, Limestone, and Gray Linen. Lake house living and rustic finish lovers agree, this blue is timeless and rich. White Wash Glaze and White Wax creates a beachy sea salted feel to this respectable color. 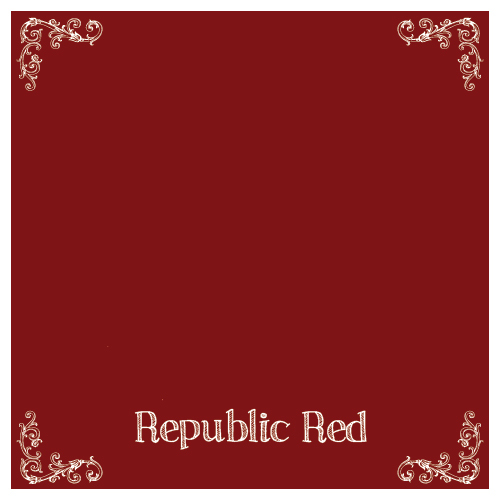 Beyond agreeable with Republic Red and Beeswax in addition to many more colors. A true show stopping peacock blue. Navy with a slight emerald cast create an unforgettable and one of a kind color. 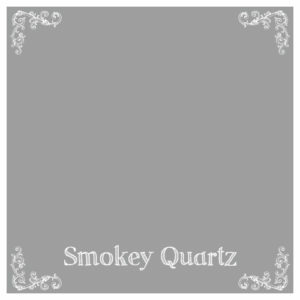 Dramatic and attention demanding, it is a gorgeous accent to whites, Gray Linen, Smokey Quartz, and more. Limited Edition Spring 2016. Pale Peony Shabby Chic Pink! This girly shade is a dusty pale spring pink that is timeless and will forever be modern and vintage at the same time. Black Wax adds vintage patina or Gold or Pearl Glaze glamorize this girly favorite. Tropically drenched coral pink with dramatic influence. Excellent paired with Deep Turquoise, Mermaid Kiss, or 1950’s green. A modern alternative to pastel pink for little girls and all other lovers of pink! 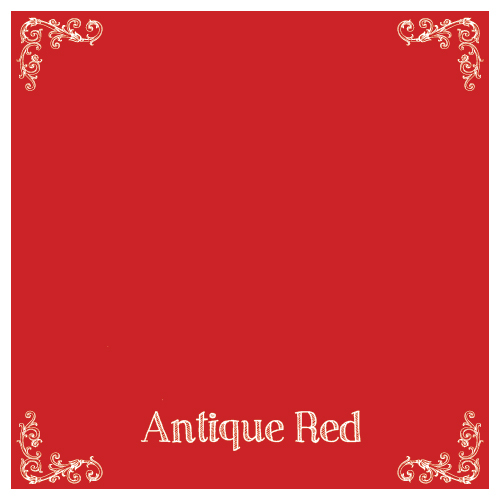 A captivating Americana red, reminiscent of a faded flag with vintage flair. Complimented by Anchor, Beeswax, and more. Black Walnut glaze adds old barn patina to this shade. A cranberry red that was inspired by a vintage Union Jack Flag. Just enough brightness and red pigment to be attention grabbing with a slight vintage cast to it. Black Glaze adds dimension and brings out more of a vintage finish. 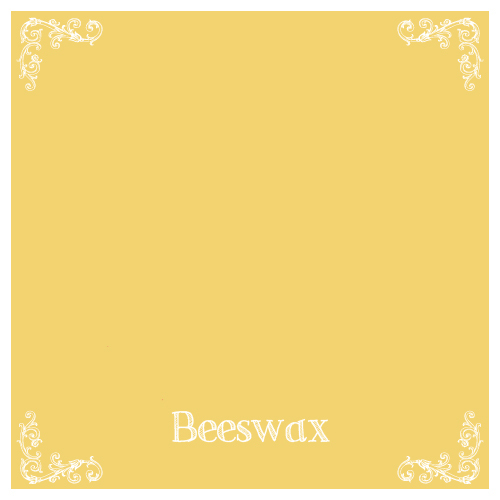 A golden harvest color that is a natural shade of rich yellow, a true representation of beeswax, this color is complimented by reds, grays, and more. Wise owl Chalk Synthesis Paint is a versatile paint capable of producing a multitude of finishes. This guide will include basic instructions and I will touch on some variations as well as offer tips. The beauty of chalk style paints is eliminating most of the prep work. All painting must include some prep because you must make sure to thoroughly clean your piece to eliminate product buildup. Furniture polish and waxes are barrier products, and those must be removed to ensure proper adhesion of paint. Clean with a household cleaner than doesn’t include oil. I prefer LA’s totally Awesome found at the Dollar Tree, for especially dirty pieces. It will remove mildew, smoke, product buildup, and more. For pieces that just need a quick cleanup, I go the greener route and use vinegar and water to clean. You may need to sand out any scratches or imperfections but, the paint will smooth out and fill minor scratches. You do not need to sand your piece down to the bare wood or prime. In some cases, laminate furniture may be primed to give a stronger base for adhesion but this is not usually necessary. Some furniture pieces are prone to bleeding through. This is when the tannins in the wood seep through the porous nature of the paint and may stain or discolor. Mahogany, knotty pine, and more are culprits that could produce staining. In this case, a barrier should be used like shellac. You may use shellac right over any areas that you have experienced discoloration and then paint over once covered with a barrier product. 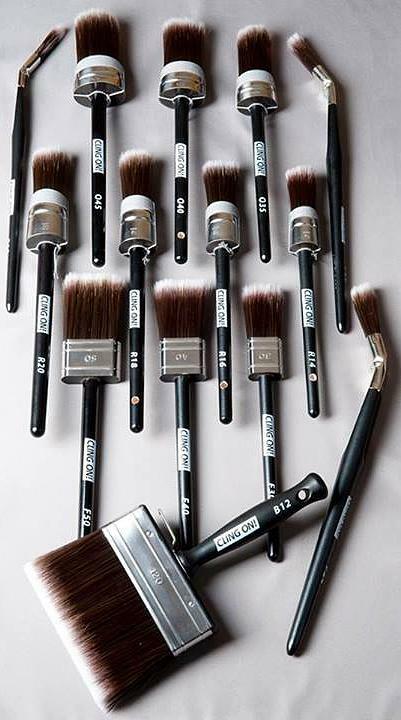 There are many brushes designed for furniture painting and you will find it is not always 1 brush fits all. I find myself using an array of sizes and styles from natural bristle to synthetic. 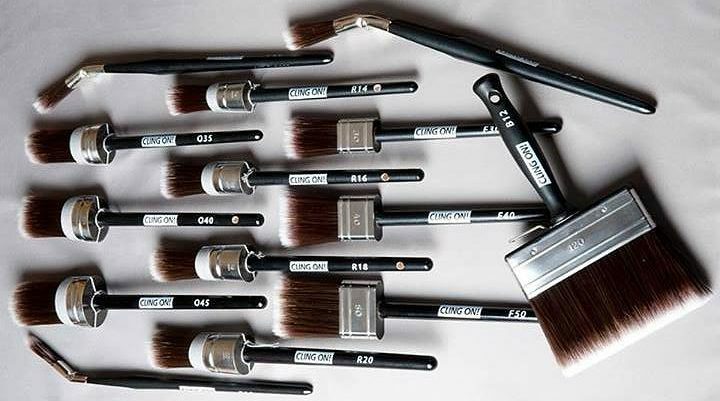 The smooth bristles of a synthetic brush, lends itself to a more uniform, minimal brushstroke finish. Natural Bristle brushes are wonderful for creating a textured finish and for dry brushing for shabbier or rustic style finishes. 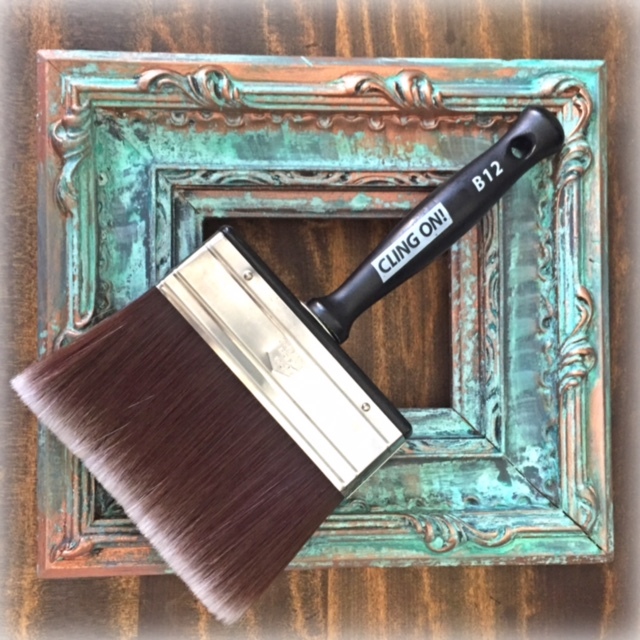 The Cling on brush is an ideal brush for producing the smoothest finish and cuts out time sanding out brushstrokes before adding finishing products. 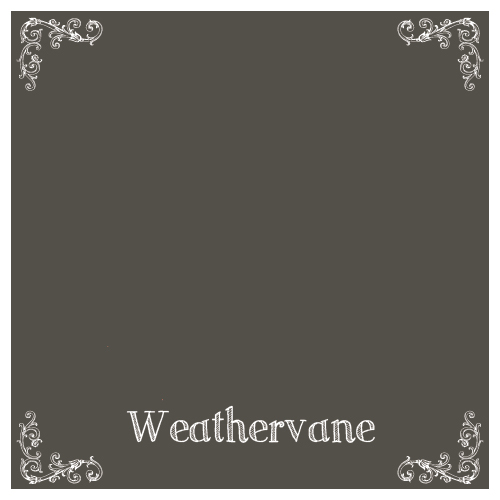 There are multiple styles but the Oval Medium (O40) is the top seller and my personal favorite. Some prefer a flat brush but it is all a matter of preference. I find the oval and round varieties use less paint and can tackle spindles, detail, and legs with ease. A natural bristle brush is my go-to for creating textured finishes. 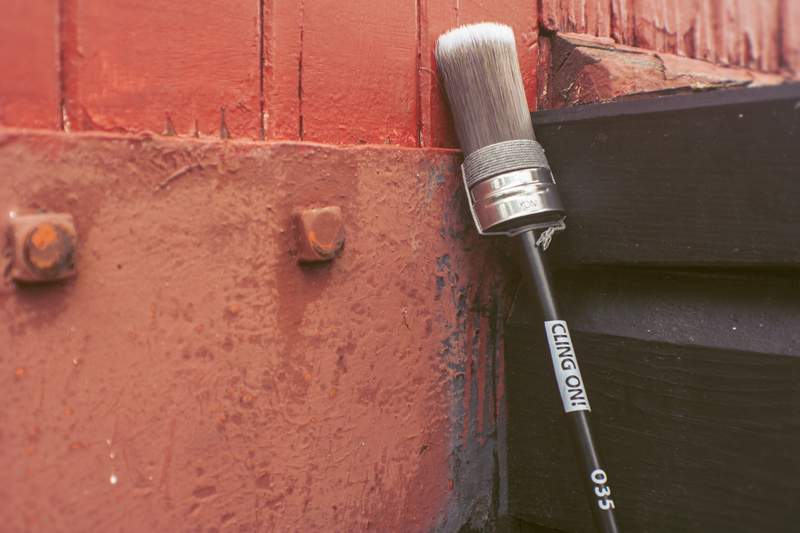 With a natural bristle brush, the less uniform bristle edge, can produce dimension and add a rustic finish. I use a natural bristle brush for pieces that I dry brush (a technique of wisping on just a little paint here and there to create a vintage finish with character.) The HQ may also be used with slightly wet bristles to produce a smoother finish. 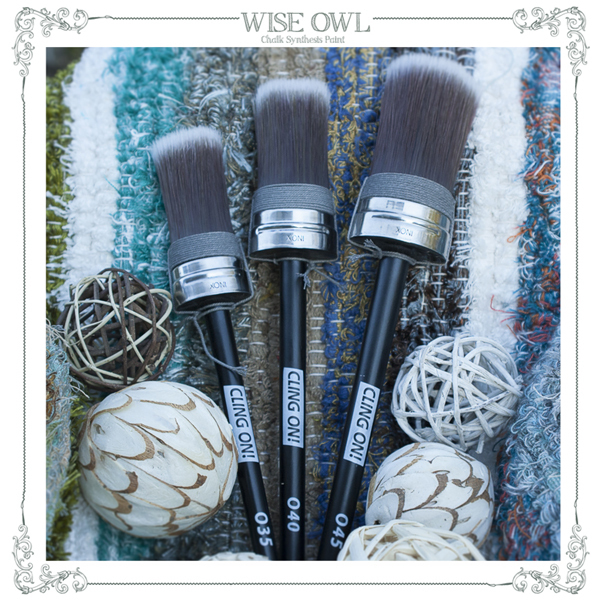 Try a natural bristle brush for applying Wise Owl Wax. Shake and stir the paint well. Wise Owl Chalk Synthesis Paint is a mineral paint, and as with all mineral paint, they can settle. Reincorporating the minerals will ensure adhesion to your piece. Dip the tips of the brush only into the paint, do not submerge up to the ferrule to preserve and extend the life of your brush and make cleanup easier. I suggest painting with the grain but you may paint in a cross-hatch pattern to create a unique rustic finish as well. Apply 1 coat and let thoroughly dry before applying a second coat if needed. If you paint over paint that is still drying, it can lift the paint that is in the process of drying. A second coat will be necessary depending on desired finish and which color you are using. Whites, red, and Black require the most coverage due to the nature of pigments. Plan to use more paint if painting with white. Since a sealant must be used with Wise Owl Paints, creating a smoother surface for your desired finish can help make application of finishing products more uniform. Chalk style paints are porous and spending a small amount of time lightly sanding for a buttery smooth surface, make application a breeze. 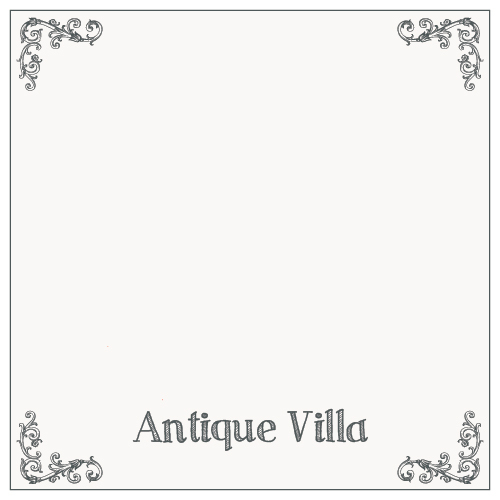 It is a common misconception that all pieces painted in a chalk style paint, are rough and gritty. Lightly sanding will guarantee the smoothest feeling surface while preserving the matte vintage style finish of the paint. Some pieces I choose to keep rough and textured when it is the desired finish. I like to use sandpaper or a sanding block of 250 grit or above. The Paint will sand easily and you will not need to devote much time to sanding, go with the grain or direction you painted in. after sanding, you will need to lightly dust off any paint dust with a lint free cloth. Sanding will lighten the color of the paint but don’t worry, this is temporary. The richness of the color will come back once the sealant is applied. Finishing products are rarely a one size fits all product. We have many finishes depending on your desired finish. First, take into consideration how much traffic the piece will have. Wax produces a gorgeous finish, but high traffic areas like a kitchen table or cabinets may need a finish to hold up to more wear and tear. 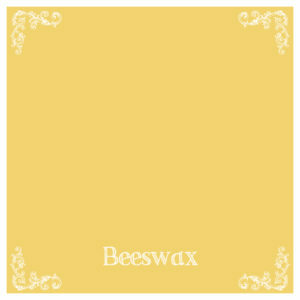 Wax- The multitude of colors and wax options we offer can create many different finishes. The black hemp oil wax is a personal favorite of mine, I love the richness it adds to the color and it collects in areas of detail to provide additional dimension. 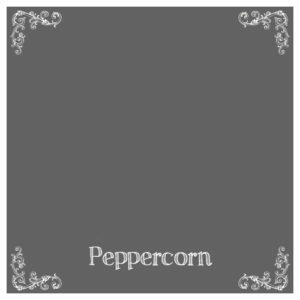 The pearl wax is another gorgeous option adding a white wash look with subtle luminescence from the metallic pearl pigment. The clear wax is best on whites if the white finish doesn’t warrant antiquing or aging in any way. It will not change or yellow the color. The hemp oil wax is a buttery smooth wax that has easy application and a strong finish. Because our hemp oil wax is a natural hemp oil shade (a rich olive oil color) it could potentially change the finishes on whites. It is ideal on all other colors and just adds a slight richness to color. Hemp oil waxes are the strongest waxes because the hemp oil will penetrate through the paint and cure to a strong finish, protecting your piece. Wax may need to be reapplied depending on use, throughout the years to maintain a lasting finish. Wax Instructions: Use wax at room temperature. If your wax is too cold, application will be difficult as the wax is at its ideal workability is at room temp. You may use a rag to apply wax but the preferred method is using a round natural bristle brush for application. This will make quick work of waxing while creating more uniform coverage. 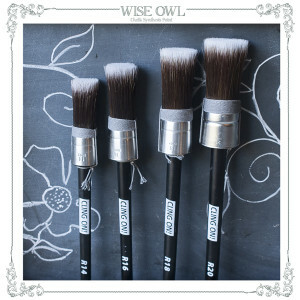 Swirl your natural bristle brush in the wax a few times until you can just barely see the wax on the tips of bristles. A little goes a long way so save your elbow grease and cut out buffing time later. You may wax in circles or with the grain but work in small sections by applying the wax and buffing off with a lint free cloth. An old t-shirt will do but if you are waxing a piece painted in black, use a dark t-shirt, and use a white t-shirt on whites. This will help eliminate visible lint from showing up in your wax finish. To buff off, wipe the wax off until it no longer feels tacky. Move on to the next small section and continue until you have waxed all painted areas. The wax will continue to cure to its strongest finish over the period of 2 weeks-30 days depending on environment and relative humidity. You may use your piece while you are waiting for it to cure, just know, it is at it strongest protective quality after the waxes and oils are able to re-harden within the paint. 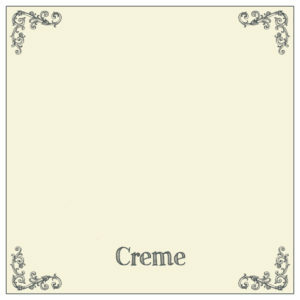 You may layer waxes of different shades to create your desired look. Remember, wax is last! Since wax is a barrier product, you will not be able to polyurethane over wax. Should you decide to paint over a waxed finish, lightly sand and clean well to remove wax buildup. Hemp oil is an ideal sealant and this stuff is magic! If you desire a buttery smooth finish with a tenacity that rivals poly for protection and is even suitable for outdoor furniture, hemp oil may be your best option. Once again, hemp oil is a rich natural hemp color that can range from rich olive oil to amber depending on the season it was collected in. This makes it suitable for colors besides white since it can antique or discolor whites lightly (Unless you are going for that look then go for it!) Hemp oil is a natural fungicide with anti-microbial properties that richens wood and makes a killer strong paint sealant. Hemp oil is great to re-hydrate, protect and richen raw wood, sealing stained pieces instead of using a polyurethane, shining up wood sealed with a poly, or for removing patina from hardware. If using hemp oil on a heavily distressed piece, you will find it penetrating through the wood finish beneath and adding richness and beauty to it. The key to finishing a painted piece with hemp oil is wet sanding. This process cuts out a couple steps since you are sanding, distressing, and sealing in a single step. Once your paint is fully dry apply hemp oil in small sections. You may apply with a paintbrush, a sock, applied directly on the sanding block or paper, or squirted right on your painted piece. Once applied, sand the oil into the surface of the paint working in circles. If a distressed finish is desired, use the hemp oil and sand paper to remove paint where you would like to distress. This can create a dimensional look unlike sanding alone. Once you have sanded, buff well with a lint free cloth. Make sure to remove all surface hemp oil until it no longer feels tacky or wet at all. If you leave too much hemp oil on surface, it will become sticky as it cures and hardens. If any part of the finish looks uneven, then the hemp oil was not able to fully saturate the paint. Just apple a little more, sand lightly and buff off. A little goes a long way but you want to make sure the paint and wood can absorb enough oil to ensure a strong and even protective finish. The hemp oil will harden within the paint within 2 weeks-30 days. The process of curing happens as the oil emulsifies with the paint and becomes hard similar to tung oil. The advantage to hemp oil over tung oil is it never spoils over time. 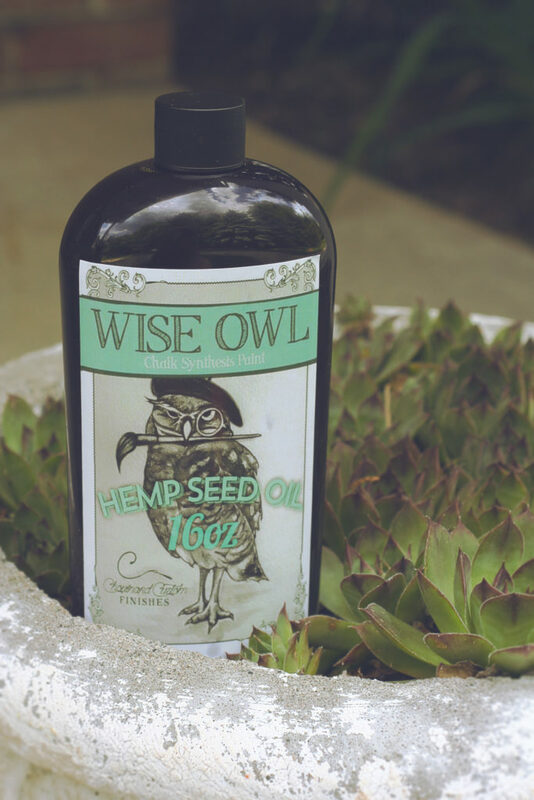 If shouldn’t need additional hemp oil for protection but if you feel it needs a light sprucing up, you may apply with a rag and buff lightly. This is especially helpful with outdoor pieces. You may still wax over hemp oil if you desire color from a wax finish, but it will not absorb as heavily as a painted alone piece and would be a subtle finish. Glaze adds a unique antique finish to painted pieces. If you desire a less uniform look than paint alone, or have a piece with lots of detail, glaze may be a good choice for your piece. Our Black Walnut Glaze is a favorite and adds a rich dark brown patina to pieces. You may also glaze over a surface finished with polyurethane, or over a raw wood finish as an alternative to a gel stain. To glaze over paint, sand well! This is one time when it is absolutely necessary to create a smooth finish before beginning. Sanding your paint will close some of the pore space so the glaze will absorb in a more uniform finish and allow the glaze to glide over when wiping away. To apply glaze, work in small sections. I recommend practicing on a smaller piece or frame before taking on glazing a huge piece as you perfect your desired technique. Apply the glaze in the direction you painted, with a sock or a paint brush. After applying, immediately wipe away glaze until desired finish is achieved. Work quickly and do not try to wipe glaze after it has begun drying. Remember, glaze will remove glaze so if you overlap over glaze that is in the process of drying, you can pull up some of the glaze. This is ok, but to get a more uniform look, quickness is key. If you aren’t happy with an area you have glazed, you may add a little more glaze and wipe away to remove some of the previous finish. Allow the glaze to settle and stay in areas with detail to add a dimensional look. A second layer of glaze may be added once dry if more dramatic finish is desired. You can apply with a sock on your hand and wipe off with another sock on the other hand for quick easy application. Our glaze itself is a strong sealant, but depending on the amount of glaze left on surface, you may need to apply a wax or polyurethane for extra protection. Our glaze can be painted over once dry without any issues should you decide to change the finish. Our topcoat is unlike any other water-based topcoat. Our varnish formula is truly revolutionary. We utilize a crystal clear resin to yield serious protection that will not yellow or discolor whites due to the crystal clear technology. Our Varnish provides industrial grade strength suitable for cabinets and high traffic areas. 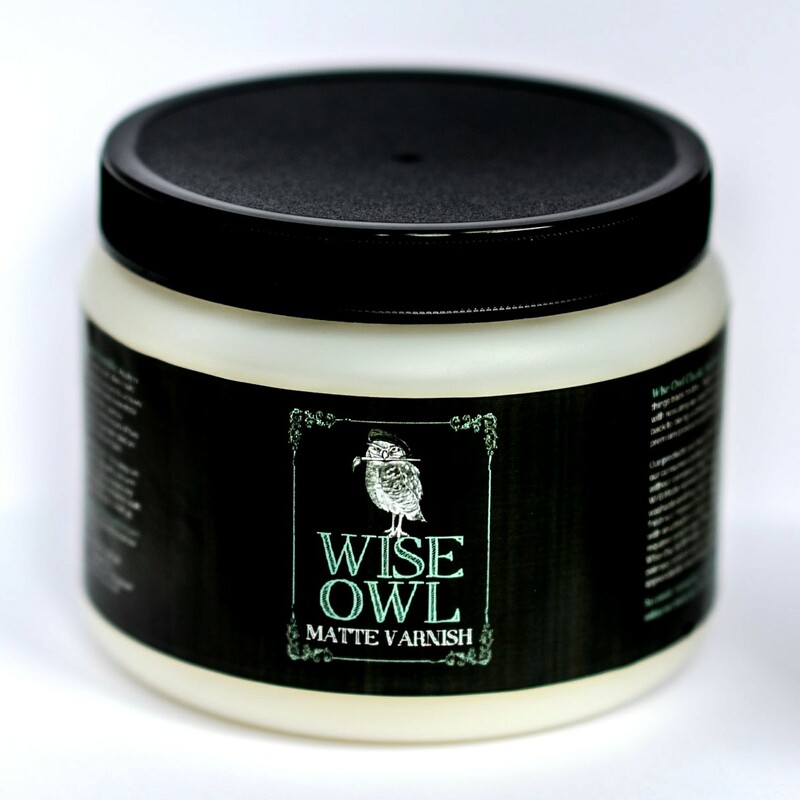 The matte varnish is a truly flat finish to preserve the matte quality of Wise Owl Chalk Synthesis Paint and the Satin Varnish has a slight sheen. There are so many finishes you can create from our line and I will start adding more tutorials soon featuring color washes, dry brushing, decoupage, stenciling and more so stay tuned and as always, Happy Painting! What Is So Great About Cling On Paint Brushes? I get so many questions about Cling On Paint Brushes and everyone wants to know what makes them superior to all furniture paint brushes. There are several attributes that make them the go to brush of many professional furniture painters. 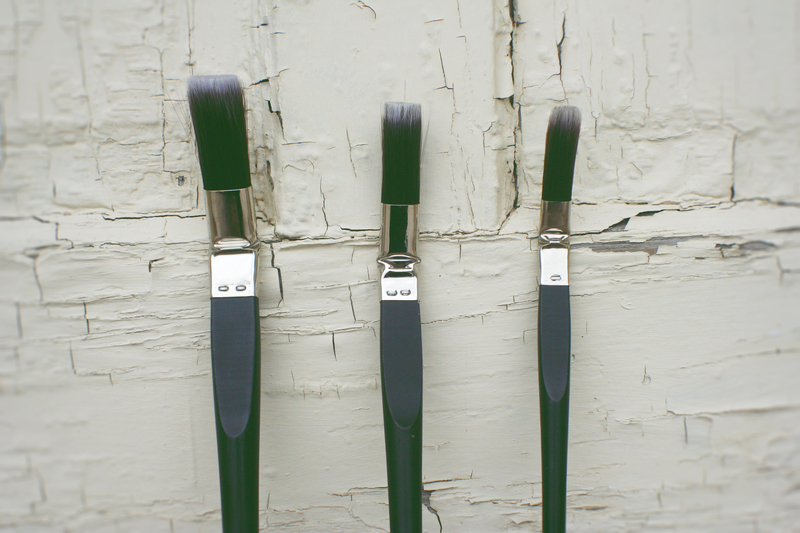 Here are some reasons why Cling On paint brushes are so wonderful. CLING ON! Brush Tips -Let your bristles absorb some water prior to use. Some say, let your brush “Get its feet wet”. -Do not remove the attached strings present on the round and oval styles. They help preserve shape retention of brush. Try to keep from dipping the brush up to the strings to preserve the life and make brush cleanup easier. -Lightly wring out or spin brush handle between hands to remove excess water prior to use. -Store your brush in water when not in use. 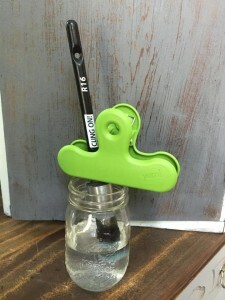 A little water in the bottom of a mason jar and a chip clip attached to the handle to keep bristles suspended, will provide an excellent home for your brush and make cleanup a breeze. -Dip the tips of bristles in a little water while painting if the paint seems to be drying on the bristles. 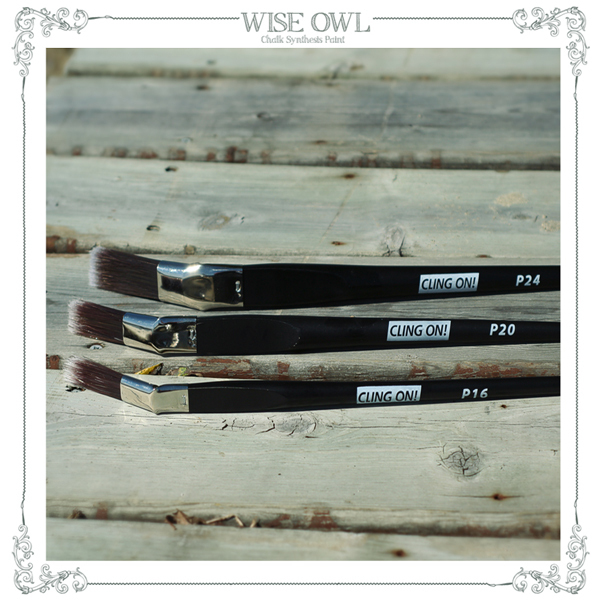 This is especially useful while working outdoors and will help promote the flawless brush stroke free finish. 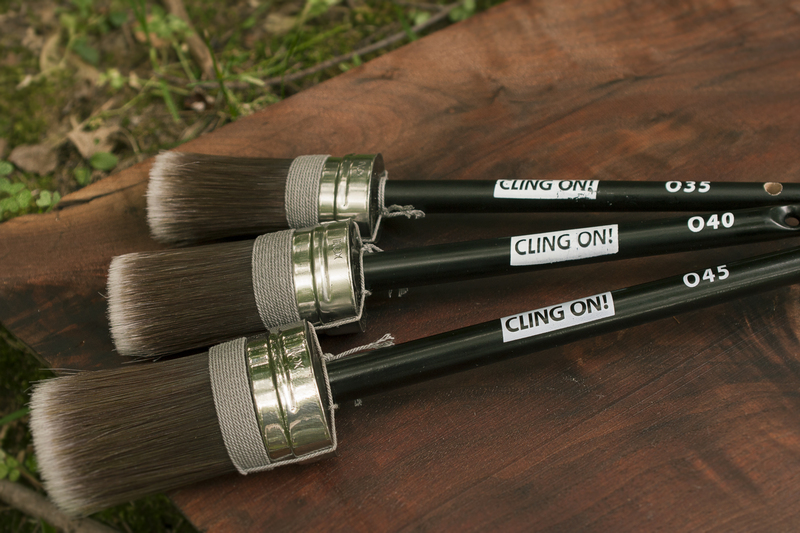 You can buy Cling On Paint Brushes here! 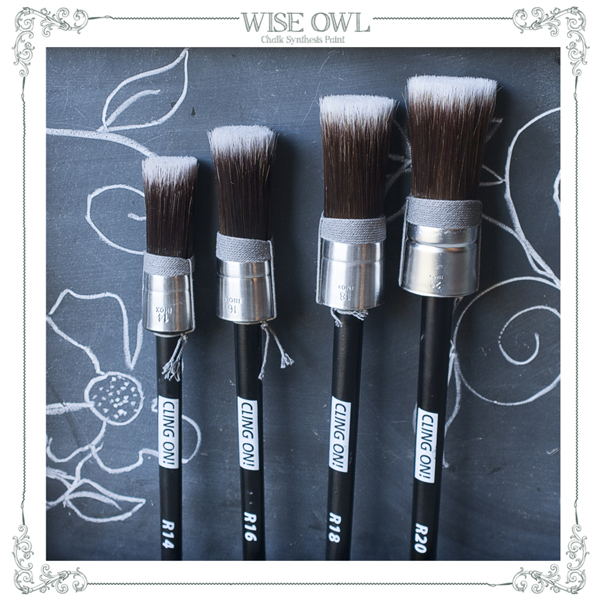 Interested in becoming a Wise Owl Paint or Cling On brush Vendor? Send us a request! 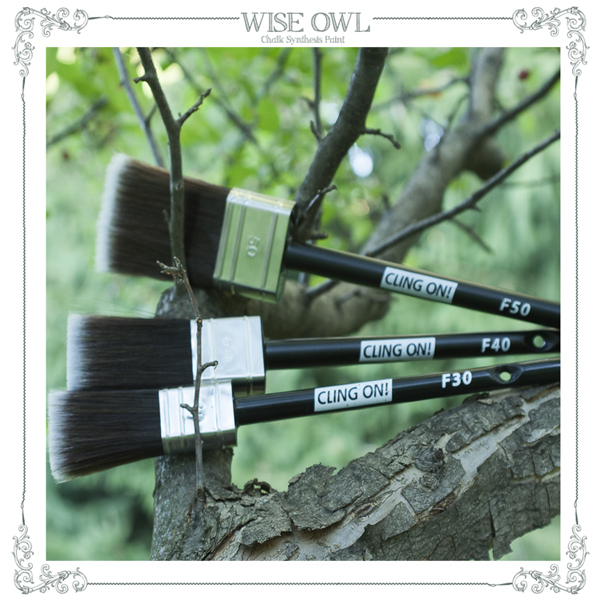 Don’t forget to check out our blog on how to care for your Cling On Brushes! 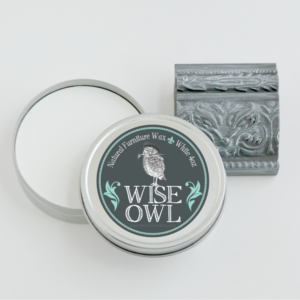 Wise Owl Chalk Synthesis Paint was born from a need to bring things back to life. It is ironic that the same concept was the inspiration for the name itself. The reason Wise Owl was chosen as our brand name was because as a child, I cared for injured and orphaned owls with my mom. She was a wildlife rehabilitator specializing in birds of prey. Nurturing the sick and wounded is what my mother does best. From a very young age, I was part of this process. We cared for hawks, eagles, owls, song birds, raccoons, opossums, ground hogs, squirrels, and more. Round the clock feedings for the babies or attending to injuries was part of my childhood. One thing was certain – if an animal needed care my mom would never turn them away. Following in my mother’s footsteps, I continue to rescue wild animals to this day. Great horned owls were the most majestic and resourceful of all of the animals. I was always drawn to their quiet strength and my love for them has lasted throughout the years. When it came time to choose a name and logo for my company I remembered how the Wise Great Horned Owl had inspired me and I hoped that my paint would inspire others. I hoped that it could be a tool to bring things back from injury, from the trash, or simply to bring it back to being a cherished piece of furniture once again.